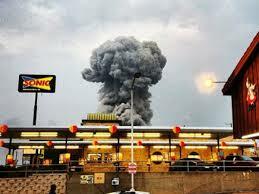 Today I’m thinking about the tragic explosion of a fertilizer plant in West, Texas. Having lived in small town for a period of my life I understand how one explosion can impact an entire city. As a native of a large, sprawling urban city, I also understand why many in America don’t understand how far reaching an explosion of this magnitude can be. In small town America it is not unusual that you know someone who works at or does business with a large manufacturing facility like the fertilizer plant in West. As a woman, I am thinking about the extensive impact this explosion will have on the families in this small town. I think about the mothers and fathers who have lost partners, children and friends. I am thinking about the loss of livelihood. I am thinking about the fact that homes that have been lost. I'm thinking about children who have lost the sense of normalcy that showing up at school each day provides. The photo of “babies first birthday” that can never be replaced…It’s gone forever. That photo of three generations of women that we all have with the new baby, the mother and grandma…. It’s gone forever. It can’t be replaced. I am also thinking about the strength of small communities to survive in the face of tragedy. Because everyone knows someone who works at or does business with the large manufacturing facility in West, Texas the entire town is invested in seeing the town survive and thrive. President Obama has signed an emergency declaration to provide needed funding to the people and infrastructure in West, Texas. OSHA is doing their investigation into the cause of the explosion. The details and finger pointing will all be revealed in due time. But for now my heart aches for the families. Because of the indomitable spirit of Texans and of Americans, the entire nation will support its rebuilding process. This Woman’s Words joins West, Texas in prayer and faith.